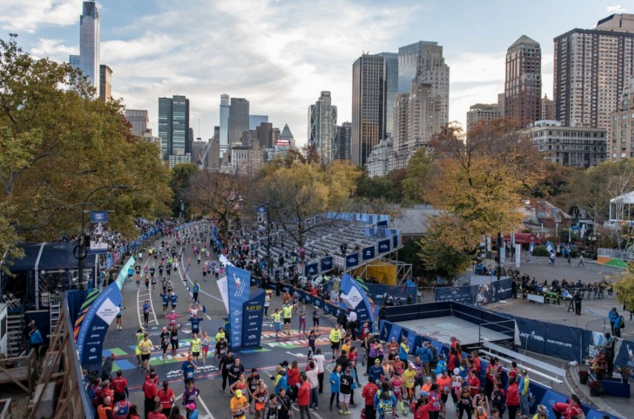 Dave Young gives a detailed account of his New York City Marathon experience. Route: Starting at Staten Island, across the Verrazano Narrows Bridge to Brooklyn. Proceed through Queens and cross the Queensboro Bridge into Manhatten. Run up 5th Avenue to the Bronx district via Willis Ave Bridge. Re-cross the Hudson River over the Madison Ave Bridge into Harlem. Proceed along 5th Avenue, Finish in Central Park, 26.2 miles. Organisation: New York Road Runners Club. Security as expected tight but officials friendly and accommodating. Collect number from the impressive Javits Centre Manhatten Friday or Saturday before race day (this is where Hilary Clinton was planning to do her opening Presidential speech after the Election). Officials are on hand to assist if like me you haven’t previously arranged transport to the start on race day. Note – this is important and should be done when entering the race. In my case I was allocated a bus 5:30am from Central Library to take me to Staten Island. Security was very strict during race day – you are given a clear plastic bag with your race pack and must use this for bag drop purposes. No backpacks, hydration bags, opaque bags allowed. On arrival at the start villages, Fort Wadsworth Staten Island, Airport type Security applies – full body scan and x-ray of bag drop etc. Numbers must be visible at all times or no admittance to the start villages. Start Village: Once you get into your allotted village zone (there are 3) facilities are excellent. Free Tea, Coffee, Energy Bars/Drinks. I saw people eating Bagels and there was a Dunkin Donut stall but I resisted the temptation. On a downside, due to security you need to get to the villages very early (I was there by 6am for 9:50am race start), and it is a cold, long wait until the race begins. It is advisable to take old clothes to keep you warm while waiting for the race to start. I didn’t do this and had to buy a cheap top the day before, to throw away at the start. I liked it too. Atmosphere: When the Marathon started the experience was unique to anything I’ve ever experienced at a race. New Yorkers are very patriotic; Actress Cynthia Erivo sang the national anthem and it seemed that everyone (except me) was singing along with her. She also completed the run in a very respectable 3:57. The US Army crew firing the start cannon were assisted by the colleague of an NYPD officer who was shot and killed in the line of duty in the Bronx on the Friday before the race. The colleague was present despite also being shot during the incident, several times in the leg. Overhead I spotted 5 helicopters and 2 small planes circling the area. Once underway, the race crosses over the Verrazano Narrows Bridge which gives an amazing view of New York City. After this you drop down into Brooklyn (mile 2) and this is where the spectators first appear. The support given by the spectators is second to none and continues relentlessly for the rest of the course. It seems that most of the city turns out to cheer you on. International Football strips, Spain, Argentina, and Sweden etc attract attention, along with traditional dress outfits such as Inca and Red Indian. Club Vests tend not to attract so much encouragement, I was however surprised when a guy shouted “why aye pet” in the Bronx district when he saw my TBH vest. Perhaps he was an exiled Geordie. I was offered a glass of lager at mile 24 and it was one of the hardest decisions of my life to turn it down. 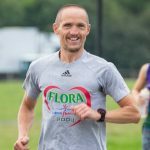 UK Runners: Saw very few UK running club vests. I did pass a young woman at mile 12 with Geordiegirl emblazoned across the back of her running top. Had a brief chat and found out she lives in Newcastle but isn’t a member of a club. I did tell her to come to the Harriers so hopefully she will give it a go. I think she will have finished sub 4 hrs she was running solidly when I saw her. I also glimsped at part of an amazing tattoo on her back. Finish Area: As expected very well supported and easy flowing. Security tight but a long walk (1 mile) to the bag pick up zone. Goodie bag standard – included an Apple and a Protein Drink. Medal – blingy. First Aid people were on hand keeping a look out for anyone in need of assistance. Luckily the weather was good and the walk to pick up my kit wasn’t too bad. In my case I had already planned my journey back to the apartment and the walk to the bag pick up zone was part of my route – 3 long, slow, painful miles in total. I would strongly recommend anyone planning to do the race to make sure they plan and know their way back to where they are staying from the finish area. It is easy to get lost in Central Park, and a lot of roads are closed surrounding the area. Getting a cab after the race would be difficult and could take a long time. TAKE WARM CLOTHES TO PUT ON AFTER THE RACE! Accommodation: We rented an apartment in Harlem I would recommend this area for anyone thinking about visiting New York. It’s well linked by the Subway to the City Centre. For runners and walkers Central Park is close to hand via 5th Avenue and the City Centre is within walking distance on a nice day – 4 miles. Unfortunately for me, the race passed by my apartment at 22 miles which was difficult (I was a bit tired at this stage of the race). Food & Drink: Unfortunately very expensive in Restaurants and Bars, even in the outlying districts. Did find a handy corner shop (convenience store) which was good and fairly cheap for snacks and drinks. The best Burger Restaurant in New York is located in Harlem, Lennox Ave 122nd Street. It’s called Harlem Shakes and is second to none, I can vouch for this. Overall Experience: Second to none Marathon Wise. Saw some amazing sites (including 3 Turtles in a lake in Central Park (real ones not Ninja) New Yorkers are generally very friendly, except when driving. The NYPD are second to none, they have such a difficult job but always stop to help, especially when you get lost in Central Park! 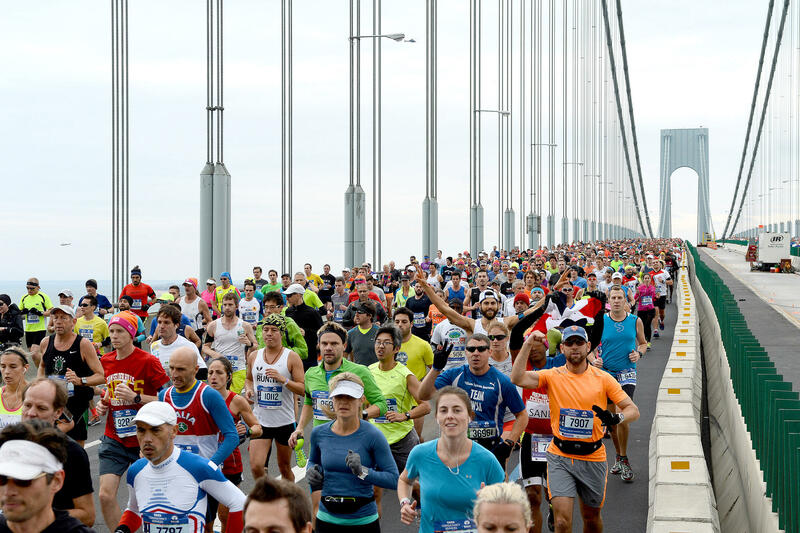 I would recommend putting the New York Marathon on your “to do” list. Fascinating read Dave, and thanks for sharing your experience. That must have been one helluva game of I-Spy between 6am – 9:50am haha!! Never again will I moan about having to hang around for an hour or so before the GNR. Great read mate. My only concern is you passing up donughts and beer. You’ve changed and not for the better?? Great report Dave, interesting to read about all the security but supposed it’s just a sign of our times! Well done. A very informative race report Dave I am intrigued about the tattooed lady. May I suggest taking an NCB donkey jacket to wear on the long wait before the race as this will totally bamboozle our American friends. What an amazing, life-affirming event. You must have quite a CV these days. Aye, there’s no stopping the Old Fox, it seems, age doesn’t touch them bones. And there’s plenty more to come, I bet!